Is your investment in content marketing really paying off? 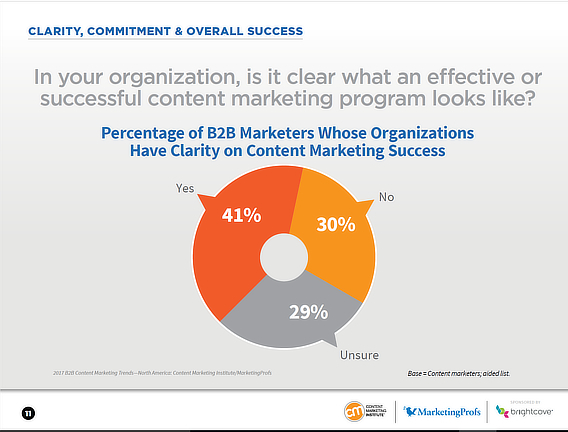 According to the Content Marketing Institute, most marketers aren’t even sure what a successful content marketing program looks like. You know from the statistics that content marketing works. But how can you prove whether a blog post, tweet or lead magnet really contributes to your bottom line? How else can content marketing benefit your business – and can those indirect benefits even be measured? By the end, you’ll understand how to work out content marketing ROI, so you can be sure your content strategy is delivering value for your business. Content marketing ROI is a percentage that expresses how much revenue you gained from content marketing in comparison to what you spent. For many businesses, ROI is the most important measure of successful content marketing, because it’s directly tied to revenue. But money’s not the only indicator of how well your content marketing strategy is working. Let’s face it, if nobody’s viewing, sharing, and responding to your content, it’s unlikely to earn any revenue for you. That’s why it’s also important to think about which content marketing metrics really matter. We’re going to look at 7 important metrics later in this article. 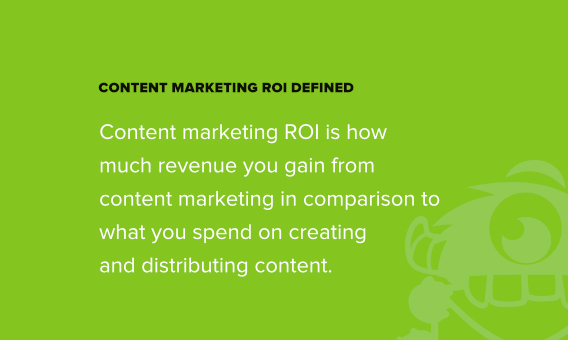 But first, let’s look at the content marketing ROI formula. Step 1. Figure out how much you spent to produce the content. Even if you produced it in-house, there’s still a cost attached, because you’re paying the content creator’s salary. The cost of production will also include any external content assets you had to pay for, like images, video, audio or any outsourced work. Step 2: Figure out what it cost you to distribute the content. Again, don’t forget those in-house costs. Include any paid promotions, such as PPC advertising and social advertising, as well as promotion through other media channels. Be sure to include the cost of any special tools or software required for either content creation or content distribution. When you add up all these expenses, you’ll know the true cost of producing your content. Step 3: Work out the dollar amount for what you got in return. If your content is working well, it’ll generate leads that turn into sales. Sometimes, there’s a clear link between content and revenue, such as when people read a piece of content, click on your call to action, then buy something. At other times, that process takes a bit longer, the relationship between content and sales isn’t as direct. We’ll look at some of those less obvious content marketing metrics later in this guide. But if you add up all the sales that resulted from a piece of content, you’ll know how much you earned, which is your return. Step 4: Calculate your content marketing ROI. We like the simple content marketing ROI formula from Convince and Convert: “Return minus investment, divided by investment, expressed as a percentage”. The bottom line: if you spend less on producing content than you earn in sales, then it’s worth it. Now that you understand how to work out content marketing ROI, we’re going to look at some of the key metrics that help you understand and report on content ROI better. Be aware that content marketing success isn’t always about money; we’ll also look at some less tangible metrics below. Before we get started, you’ll need to have Google Analytics set up on your site. If you’re using WordPress, you can follow this beginner’s guide to installing Google Analytics in WordPress. There are 7 key content marketing metrics that matter: lead quality, sales, web traffic, onsite engagement, social media engagement, SEO success, and exposure and authority. We’ll take a look at how to measure each one in detail below. Which Content Marketing Metrics Should You Track? Looking at all the tips below, it’s easy to get overwhelmed. Keep in mind: you don’t have to track every single metric here. If you’re planning a big pillar article to attract links to your site and boost your search engine rankings, then you should set specific goals for the results you want. Then be sure to track new backlinks to that post and to your site, and monitor your search engine rankings after publication. If you’re planning a social media campaign to build buzz around a new product launch, then you should track exposure and authority metrics listed below such as media mentions, and keep an eye on your social media engagement. In order to determine your content marketing ROI, it always helps to plan ahead, set specific goals, and choose just a few meaningful metrics to track. First, let’s look at whether your content has the potential to earn you money. To measure that, you’ll need to look at leads and sales. As our guide to lead generation says, great content attract an audience, and an audience can generate leads. That’s why content marketing is so crucial for lead generation. People read your blog post and grab your lead magnet, which shows they could be thinking about doing business with you. Your visitors check out related resources that are part of your marketing or sales funnel. Visitors contact your sales team to ask pre-sales questions. These actions indicate that your content is generating qualified leads, who are likely to buy eventually. One way to track whether your visitors are qualified is to see whether they’re visiting important pages on your site, like your pricing page. To do so, you’ll need to set up goals in Google Analytics. Once you’ve set your analytics goals, go to Conversions » Goals » Funnel Visualization to see which pieces of content help turn people into leads. Here’s an example from a freelance writer. On this site, 98% of the people who looked at the portfolio followed the next step and checked out rates, which shows they are interested in using these services, making them qualified leads. If you’re getting a lot of traffic but have a high bounce rate and low conversions, that’s an indicator that the leads you’re attracting are low quality, and aren’t looking for what you have to offer. Next, you’re going to look at how many of these leads turn into sales, and what the value of those sales is. That’ll give you one of the key numbers in the content marketing ROI calculation we shared earlier. If you’ve got qualified leads and are nurturing them with the right content at the right time, then some of those people should buy something. 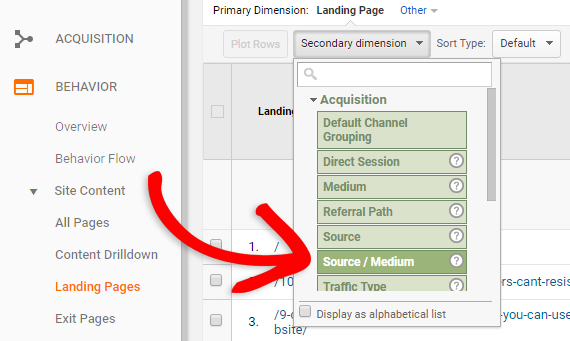 You can get exact numbers on this in Google Analytics by navigating to Behavior » Site Content » All Pages if you’ve enabled eCommerce in Google Analytics. In this view, the Page Value column shows you the average value for a page that a user visited before landing on the goal page or completing an eCommerce transaction. This stat gives you a general idea of which pages on your site contribute more to your site’s revenue. Still, this only tracks conversions that happen during one session. As you know, content marketing isn’t always that linear. What if a visitor reads a blog post they found through Google, then leaves your site to do some comparison shopping and research, and returns to your site the next day to make a purchase? You can also track this through Google Analytics using Assisted Conversions. Assisted Conversions measure the number of conversions that a channel (such as paid ads or organic search) assisted with, at any point along the customer’s journey. To see which channels are assisting in your conversions, you can go to Conversions » Multi-Channel Funnels » Assisted Conversions. Just click on a channel and look at the Lead or Click Direct Conversion Value column to see how much money it generated, directly and indirectly. As well as tracking current performance, pay attention to content performance over time, as some pieces of content may become more or less relevant, and drive more or fewer leads and sales. Go to the top right of the screen and click on the date. That’ll pop out a calendar. Choose a preset time period, like the past week or month, from the dropdown menu, or put in your own start and end dates by scrolling through the calendar. 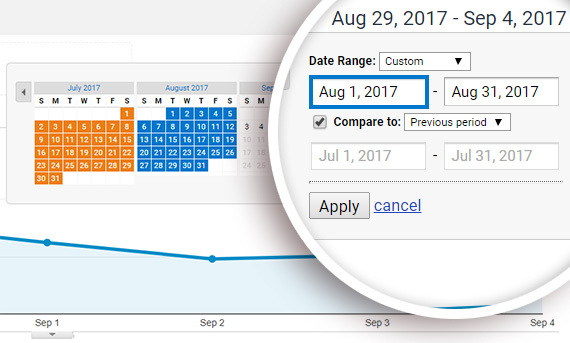 You can also click the small checkbox to compare the selected data to the previous period, to see if your conversions and sales are increasing or decreasing over time. Hit Apply, and your data will automatically refresh. You’ll continue to see data for this period as you move through the Analytics app. This tells you which pieces of content are more successful long term, and will help you decide if they should be part of your sales funnel. This will be an important part of any content marketing ROI report. Since leads and sales translate directly into income, they make it easy to measure content marketing ROI. The other content performance metrics we’ll look at are a bit harder to translate into revenue, but they’re still worth tracking: they’ll tell you whether your content is making an impact, or whether you’re wasting your time. Website traffic is the foundation of content marketing success. That’s because without traffic, there’s no revenue. 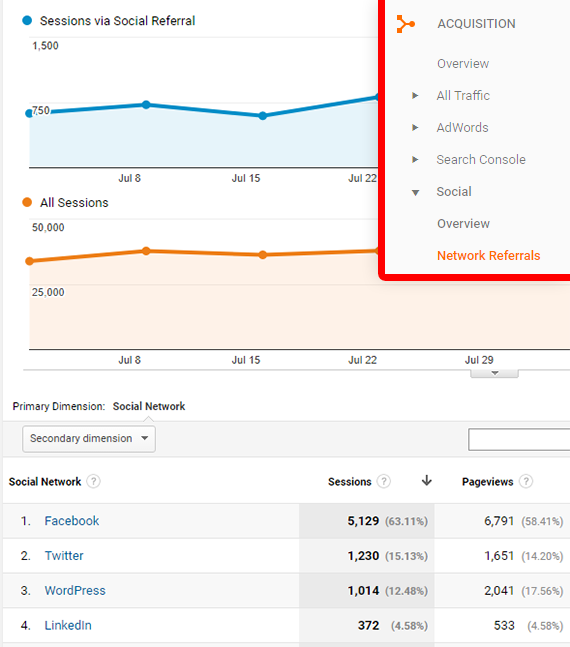 To look at how much traffic a piece of content is generating for your site, you can use Google Analytics. In the main menu, click on Behavior » Site Content » Landing Pages. This report will show you which pages your website visitors are first landing on. By default, it’s sorted by your highest-traffic pages first. Beside just looking at your raw traffic numbers, you can also look at how your traffic is growing over time by comparing time periods as shown above. It’s also a good idea to take a look at where you traffic is coming from. When you know the source of your traffic, you can figure out which part of your marketing strategy is driving traffic with the potential to convert – and which parts are wasting your time. From the landing pages report, click on the page you want to analyze. Then, click the Secondary Dimension button and click on Acquisition » Source / Medium. If you see results like this when you’re spending a lot of time promoting your content on social media, you’ll know that something isn’t working with your social media marketing strategy. Content marketing success isn’t just about getting people to your site; it’s about keeping them there. If you have a low bounce rate, and if people are spending a while on your site, or even coming back, then you know your content is working and you’re well on the way to generating leads and sales from your content. For example, if people land on your epic blog post and leave within a few seconds, you’ve got a problem. But if your analytics data shows they are reading to the end, and even checking out other content or subscribing to your newsletter, then you know that content is successful. Want a quick and easy way to see whether or not your website content is attracting quality leads? Then take a look at your engagement metrics. Measuring the way your website visitors interact with your content is a good way to see whether or not you’re attracting traffic that’s actually interested in what you have to offer. To get a quick overview of your engagement metrics, you can go to Audience » Overview in Google Analytics. Some important stats you’ll want to look at here are pages per session, average session duration, and your bounce rate. Engaged visitors will spend more time on your site and view more pages if they’re interested in what you have to offer. To find the bounce rate for an individual piece of content, go to Behavior » Site Content » All Pages. Browse through the list of URLs till you find the content, or type its URL into the search box on the right of the table. Here you can look at the engagement metrics for all visitors who found your site through a specific landing page. When you’re measuring content effectiveness, offsite engagement is also important for assessing content marketing ROI. If people find your content useful, they’ll usually link to it or share it with others on social media. Social media engagement and referral traffic is important to keep track of because a lot of purchase decisions are influenced by peer recommendations. And guess where your potential customers are hanging out? On social media sites like Instagram, Snapchat, Twitter and Facebook. 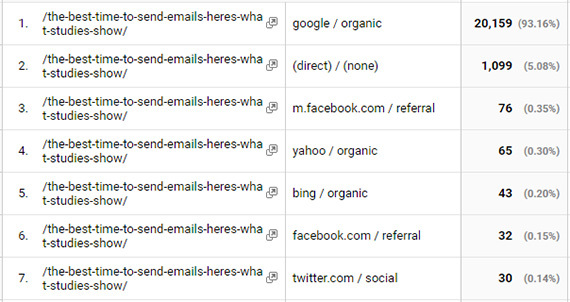 To see how much traffic you’re getting from individual social media platforms to your website in Google Analytics, you can go to Acquisition » Social » Network Referrals. Even better, you can see how much revenue that social media traffic is earning you by going to Acquisition » Social » Overview. In the screenshot above, you can see the portion of conversions that came from social media referrals. YouTube makes up the biggest portion of social referrals by far in the example above, which means their YouTube content marketing ROI is in good shape. If they’d been pouring resources into marketing on YouTube but not seeing a lot of conversions in this screen, they’d know that their marketing was not worth the investment. 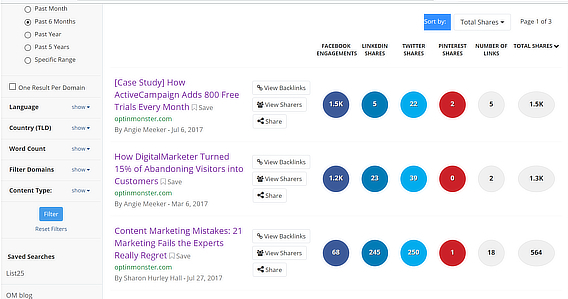 Buzzsumo is another great tool for measuring content marketing success, by tracking social media shares. If people are sharing your content, that means they find it valuable, and it also expands its potential reach, so you can get even more leads and sales. Just type the URL of a piece of content to see how many shares it’s got. You can also type in the URL of your domain to see the top 10 pieces of content on your site. Sort the results by social network to find the top performers on Facebook, Twitter, LinkedIn and Pinterest. With this information, you can tweak your content strategy to focus on the types of content and social sites that result in the most leads and sales. You can refine your search to track social content marketing ROI over periods between a day and a year, so you know what’s generating leads right now, and which content has been most successful over time. If people are sharing your content on the social networks that are most important to you, then it’ll enhance your reputation, drive traffic, bring in leads and, potentially, help you make sales, so it’s important to do this kind of analysis. If you’re measuring content marketing ROI, another important metric to keep track of is how well your content performs in search. That’s because more people click on the top search results, and more clicks equals more traffic, and more potential leads and sales. Your content ranks well for your target keywords. You’re appearing in answer boxes for relevant terms. You’re getting more inbound links. If all these things are true, your content will reach more people, and you’ll get more leads and sales as a result. First, open an incognito or private window in your browser, and search for one of the key terms that you’d like people to use to find your site. 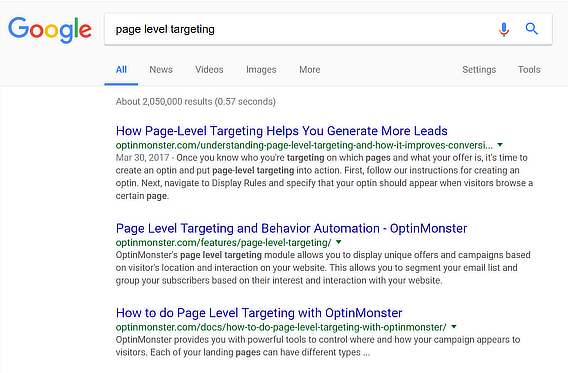 In this example, we searched for “page-level targeting”, one of OptinMonster’s key features. Check where your content appears. If it’s in the top 3, you can be pretty sure you’ll get some traffic from it. And more traffic means more leads and more sales, so this is a great way to get a quick snapshot of how your content is doing. You can also use Moz’s Open Site Explorer to find your domain authority and page authority, and the domain and page authority of inbound links. High domain authority and page authority lets you know your content is seen as authoritative and will rank well in search results. Those same metrics for inbound links shows that respected sites are linking to your content, which increases your site’s authority even further. We’ll talk more about what this means in the next tip. Most of the metrics we’ve mentioned have been online website metrics, but exposure and authority happen both online AND offline. The more people see you as an authority, the more they will want to share and link to your content, increasing its reach, and improving the potential to generate leads and sales. It’s kind of difficult to measure this in hard numbers, but you can see whether your site is the go-to authority on any topic, like Moz is for SEO issues. To track this, search for a topic keyword as described above and see where your site appears. For example, if you search for “content marketing”, the top result is the Content Marketing Institute. The Moz metrics we mentioned in Step 6 are a good indicator of online authority, because you can measure your online authority and high quality citations and track how these increase over time. You’re being invited to participate industry events or expert roundups. Track this by monitoring the number of invitations you get. You’re getting coverage from respected media outlets, and even radio and television. Create a spreadsheet to note down offline media mentions. These exposure and authority metrics are markers of content marketing success, because they enable your content to reach an even wider audience, potentially sending more visitors to your site. If people begin to recognize your brand and see you as an authority, that’ll lead to an increase in business referrals, leads and sales, improving content marketing ROI. Remember, you don’t need to track every single metric above. In fact, trying to track too many metrics can be counterproductive and lead to “analysis paralysis.” Instead, start each new content marketing project or campaign by choosing a few relevant metrics to set concrete goals for. Then your ROI will be easy to track – you’ll know exactly what success will look like. Now you know how to measure content marketing ROI, it’s time to get started on creating more content. You can start with some keyword research, which is a good starting point for creating not just blog posts, but ebooks, case studies, and other lead magnets. For even more content marketing, success avoid these content marketing mistakes the experts made. Don’t forget to follow us on Facebook and Twitter for more free guides.